Breakfast quesadillas stuffed full of eggs, sausage, tomatoes, green peppers, onion, and cheddar cheese. I have made these for breakfast and dinner, love them for either meal. 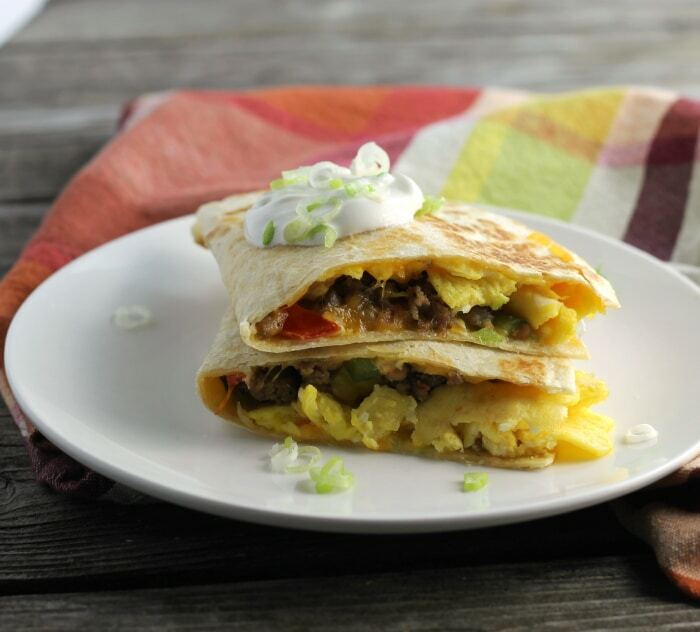 Breakfast quesadillas are a fun way to start your day. The fun thing about these babies is that you can fill them with whatever your little heart desires. The eggs, sausage, tomatoes, onion and cheddar cheese was a terrific filling. I used hot sausage for a little spice. I have been a breakfast person all my life. There is no way that I can start my day with not filling my belly first thing. I don’t think that I could function if I didn’t have food first thing. Breakfast food dinner is another thing that I adore. We try to have some kind of breakfast food for dinner at least one night a week. I love it. 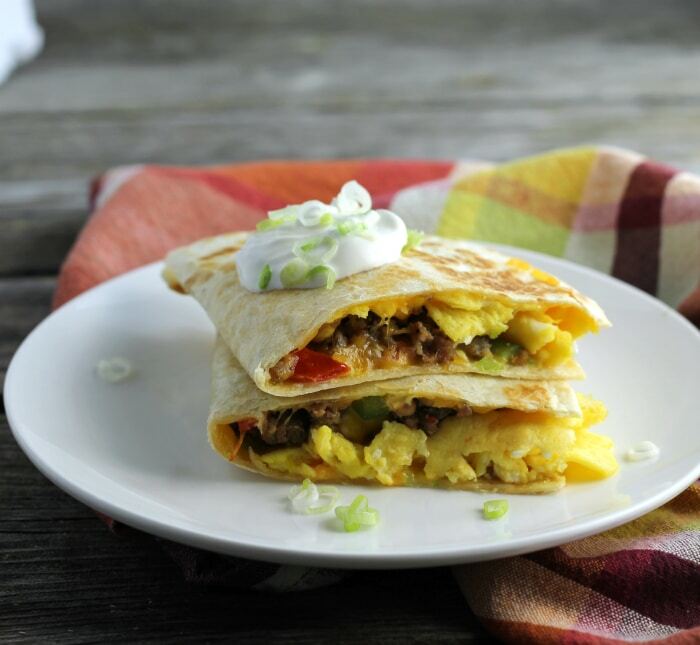 These breakfast quesadillas will be on the dinner menu on a regular basis going forward. I have to say that I love these quesadillas with the hot pork sausage, but I think they would perfect with ham or bacon. Maybe I will try bacon next. Another nice thing about these breakfast quesadillas is they are fast to make. Just a note on how to make the breakfast quesadillas easier to flip. The first time I made these I put filling over the whole tortilla and topped them with another tortilla, but it was too hard to flip them. When I flipped the quesadilla a lot of the filling fell out. I found that if you put filling on half of the shell and pull the other half of the shell over the top of the filling, it makes flipping quesadillas a lot easier. Spray a skillet with a non-stick cooking spray. Heat the skillet over medium heat. Place a tortilla shell in the skillet. Take 1/4 of the scrambled eggs and spread over half of the shell. Do the same with the remaining ingredients. Take the side of the tortilla shell that does not have any of the ingredients on it and pull over the top of the other half of the shell. Continue to cook the until the shell and is lightly brown and crisp about 3 to 5 minutes. Flip the quesadilla over and continue to cook until the other side of the tortilla shell is brown and crisp. Service immediately. Topp with sour cream, salsa, or your favorite toppings. Glad you found a way to flip that works so well. Yes, to breakfast for us ANYTIME of the day. We love it to, minus most of the stuff in yours but for Tim, yes. Either way, plenty of breakfast to go around. Good eats for sure. This looks GREAT for any meal, Dawn. Love breakfast for dinner and the idea of a breakfast quesadilla! Everything you packed into these sounds delicious! I’m a hot sausage lover too. Breakfast for dinner is my favorite! I’m with you on needing breakfast every morning–I have to eat within half an hour of waking up or I just feel off the whole day. But I’ve never had a quesadilla first thing. It’s clearly time for me to try it! Happy Monday, Dawn! LOVE love love the idea of doing quesadillas for breakfast! Fun, customizable, and a new way to get my kids some protein in the morning. Pinned! Love the flavors in this! Perfect for a late breakfast for me, or even dinner. Love breakfast for dinner! Thanks so much. 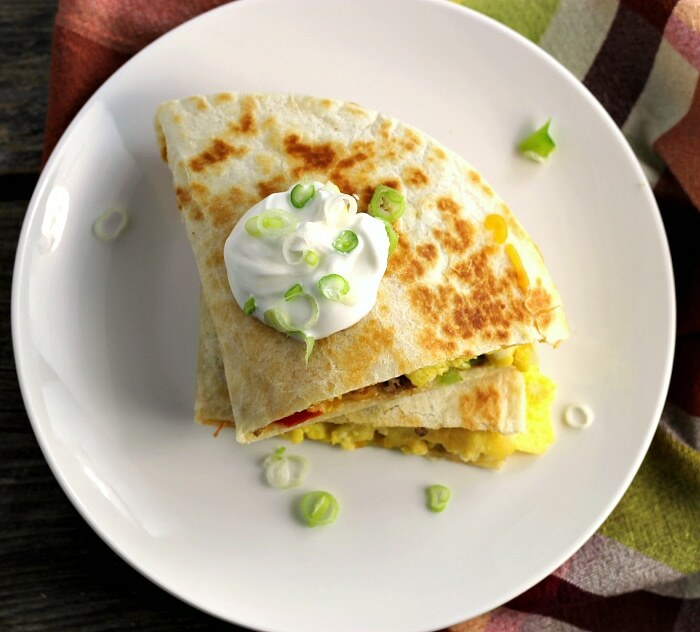 Oh Dawn, I can have these quesadillas for breakfast, lunch or dinner…everything you need in a meal…looks delicious! I am definitely on team breakfast and this looks like a fabulous way to start the day! !